Since the Raspberry Pi first went on sale in 2012, it has accumulated a customer base of five million. From the beginning, Rasp Pi fans found ever more applications that pushed the boundaries of the limited hardware built into the nano-computer – and when the computing power was really at its limit, you could always overclock the CPU. In July 2014, when the revised Raspberry Pi Model B+ was released, Eben Upton first announced that version 2 of the Rasp Pi would be available in 2017 . However, on February 2, 2015, the Foundation surprised the world with a much earlier release of the second generation of the computer. At first glance, the board in version 2 looks identical to that found in the Rasp Pi 1 Model B+ (RPi1B+; Figure 1). The format and the connections have not changed. 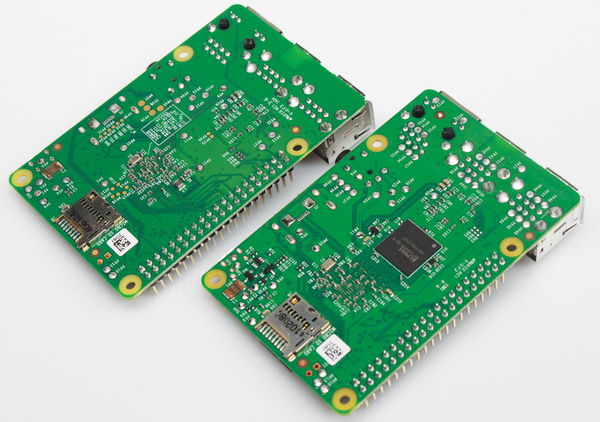 Users switching over to the Rasp Pi 2 (RPi2B) will find that the accessories and add-on boards that connect to the GPIO still fit. However, a closer look reveals a number of changes. The 512MB storage that is mounted on the BCM2835 chip  in the first model has wandered onto the underside of the board in the new version 2 (Figure 2), and it is twice as large, with a 1GB capacity. Figure 1: RPi1B+ (bottom, with extra cooling elements added) and the RPi2B (top) look very similar. Figure 2: The memory chip has been increased to 1GB in size and now sits on the underside of the board on the RPi2B (in the foreground). When Upton announced the beginning of sales for the RPi2B, he stated, "… there comes a point when there's no substitute for more memory and CPU performance" . The new BCM2836 system on a chip (SoC) boasts a quad-core ARM Cortex-A7 CPU with a clock rate of 900MHz (Figure 3), whereas the processor of the RPi1 series had a clock rate of 700MHz and only a single core (see also the "BCM2836 in Detail" box). The GPU has remained the same and still uses the well known VideoCore IV, which is the only publicly documented 3D graphics core for ARM SoCs. This makes it possible for the Foundation to use all of the work already done by developers to increase output speed. Modern embedded systems are built as a one-chip system, an SoC. This design saves space, raw materials, and power. The components contain numerous modules that would otherwise each occupy a chip on the circuit board. The modules include, for example, the processor (CPU), the graphics unit (GPU), and other modules like the hardware video decoder and encoder. Much like the x86 family that ranges from the 386 to the 486 to the Pentium and multicore processors, the ARM family has various generations of processors with different designs and accompanying instruction sets . The BCM2835 SoC used in all versions of the first Raspberry Pi (i.e., version 1 models A, A+, B, B+, and the compute module) has an ARM1176JZF-S CPU. This is based on the ARMv6 architecture as implemented for the 2003 design of the ARM11 processor. Given its age, the design is no longer entirely up to date. 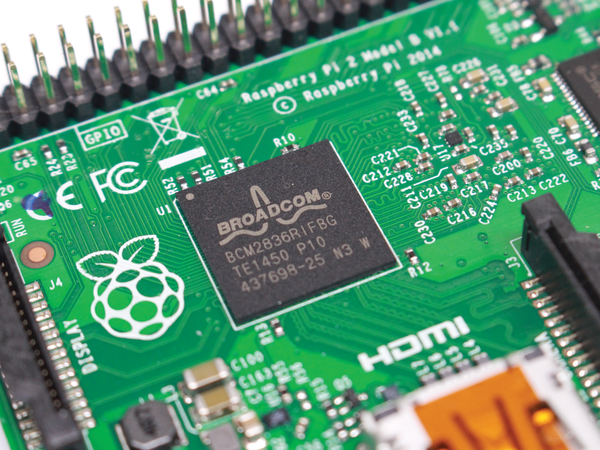 New to Raspberry Pi version 2 is the BCM2836, containing four Cortex A7 cores. (The A denotes the so-called application profile of the ARMv7 architecture, which in turn refers to the particularly powerful CPUs that have been adapted for interactive and multimedia applications). In essence, Broadcom has exchanged only the processor core in the BCM2836, because modifying additional components such as USB connections or on-chip Gigabit Ethernet controllers would have led to a longer verification process. The ARMv7 architecture sports numerous important advantages when compared with the previous generation. The Cortex A7 processor design turns out to be a modern and especially successful combination of features requiring minimal power consumption. ARM announced it in 2011 and brought it to market in 2012. More cores makes for better performance. Naturally, this is particularly true for parallelizable processes. Multithreaded applications like the X Window System are already profiting from the four cores by realizing significantly shorter reaction times and a faster desktop environment. According to Upton, it is possible to overclock every RPi2B up to 950MHz, and many boards will run at up to 1.1GHz. The actual limit also depends on the supply voltage and current. The rule of thumb is that each 1mV of additional voltage permits an increase in the clock rate by 1MHz. Figure 3: The BCM2836 SoC has one quad-core CPU clocked at 900MHz. The foundation has not changed the VideoCore IV GPU. The good news is accompanied by some sobering realities. The 100Mbit LAN ports and the four USB connectors still connect via the LAN9514 SMSC hub chip on an internal USB connection of the BCM2836. This means that the four USB ports and the network connection continue to share the bandwidth of a single port (Figure 4). Therefore, this is a bottleneck that has not yet been resolved. Many users had wanted to see Gigabit LAN and individually connected USB ports, features that competing boards have offered for a long time. Figure 4: The network interface and the four USB ports on the RPi2B still share a common data connection. 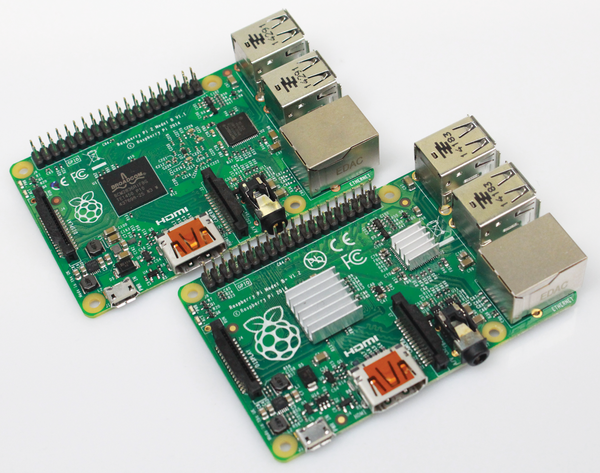 The RPi2B is fully downward compatible with the RPi1B and B+. The GPIO port, the display and camera interfaces, and HDMI and audio/video output all function as before and are all located in the same place as the RPi1B+; therefore, you will not need a new cover for the new model if you already own a B+. A micro-USB power adapter still delivers the power supply. The software update has been available since the beginning of February. Additionally, you should deactivate any existing overclocking via sudo raspi-config or change this manually in /boot/config.txt. Otherwise, you risk data loss on the version 2 microSD card. I will address other ways to manipulate the clock rate later in this article. After updating the software, you should remove the microSD card and put it into your new Rasp Pi. The software packages installed in the system continue running without problem. The downgrade process is likewise easy. You just have to put the memory card into a first generation Rasp Pi and it will immediately boot up.